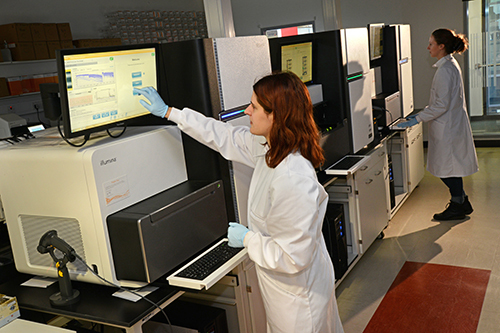 Edinburgh Genomics is one of the largest sequencing facilities in Europe, and is the leading academic open access genomics and bioinformatics service provider in the UK. It forms a major element of the University of Edinburgh’s service provision and comprises two divisions, Genome Sciences and Clinical Genomics, each with dedicated sequencing facilities. With a wealth of sequencing expertise and a proven track record over more than 15 years of delivering high quality data, Edinburgh Genomic’s highly skilled team of scientists and bioinformaticians, provides high volume data with cutting-edge analyses to a global community of research collaborators and customers across academia, government and industry. Edinburgh Genomics’ Clinical Genomics division is based at Easter Bush.